Incorporating a fast-starting, ultra-lightweight aluminum spool and counter-balanced handle, Daiwa's Saltiga Surf Conventional Reel is designed to deliver maximum casting distance with braid or monofilament. 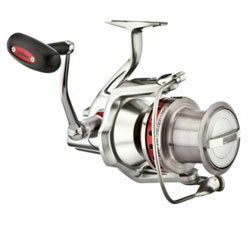 Built tough with machined, bar stock aluminum frame and side plates, the Saltiga Reel's spool combines with seven ball and roller bearings including Daiwa's CRBB specially-treated stainless steel bearings to deliver silk smooth handling. This Saltiga Surf Reel's stainless dual disc drag and lever drag combine to provide ultra-smooth and consistent stopping power for the ultimate in near-boat fish control. Complete with massive, machine-cut, high-strength alloy gears, centrifugal spool brake and rugged, precision components throughout.